University of Pittsburgh Press, 9780822963837, 80pp. 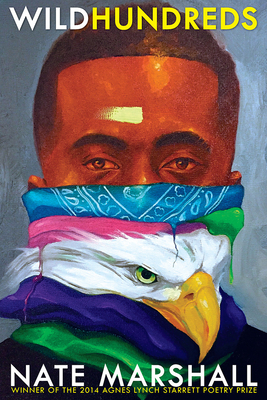 "The Chicago that Nate Marshall evokes in Wild Hundreds is more than the sum of its shames and griefs and anxieties and break beats and scraped knuckles and smoking gun barrels and wild forgettings. It's the windows rolled down on a Saturday evening in August. It's that sweet old Curtis Mayfield Impressions song you hear out the window of a passing car, telling you to keep on pushing and it's all right." "The dominant emotion of these poems is love, unquestionably. The word itself crops up often enough, but the feeling is present in nearly every verse, one way or another. . . All the poems have great energy and clarity. Rooted deeply in a particular place and set of experiences, they're nevertheless welcoming and accessible. There's a generosity in Marshall's voice, even at its most justifiably angry and uncompromising, that invites the reader to enter his world fully. These poems are never written from a distant or defensive stance, and thus they deliver a sense of intimacy and possibility. 'Ours is a long love song' is the collection's final line, and it seems to suggest, with wounded but hopeful inclusiveness, that the song of the Wild Hundreds is a song that belongs to us all."